When I was a little girl, I would play with my beloved dolls for hours and enjoyed using my imagination to role play. I couldn’t wait to have a daughter so I could watch her play with dolls the same way that I did. Much to my dismay, Hannah who is six years old would play briefly with her dolls but she has never actually taken to a doll until recently when all of that changed………….. When I learned that HABA was bring back the luxury German doll maker, Götz to the U.S. I got very excited. Götz is a German based family business that has been making high quality hand crafted dolls for over sixty years. What makes these dolls so very special is that each baby doll and doll is created to have very realistic hair, faces and bodies. There is exceptional attention to detail down to the clothing, shoes and accessories and these dolls are certain to be treasured by little girls and collectors for generations more to come. Hannah and I had fun browsing all of the Götz dolls and accessories together and she ultimately selected her favorite doll, Julia from the Precious Day Dolls collection. If I had picked myself, I would have thought that Hannah would have wanted one of the other dolls that looked more like her but instead she fell in love at first sight with Precious Day Julia ($89.99). 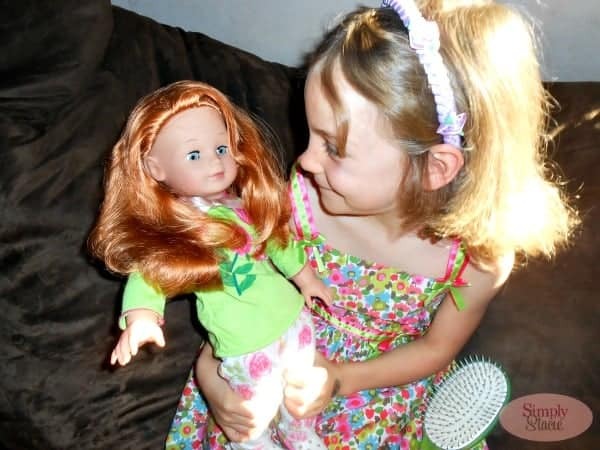 By allowing her to choose her own doll, Hannah has finally found a doll that she proudly calls her “best friend” and she takes it with her everywhere on lots of fun girl adventures. She even dresses Julia in pajamas at night and sleeps with her too, something she was never willing to do with any of her other dolls. Precious Day Julia is a beautiful 18” doll with realistic long red hair that even shows bits of highlights in the strands. She is dressed in the perfect green and white spring/summer outfit with pink floral accents. Her fashion forward sandals are adorable and she even has a purse for her tiny treasures. Julia has moving vinyl arms and legs with a soft body. This doll’s sculpted face is lovely and it has eyes that open and close and even “real” eyelashes. My daughter loves that Julia’s hair (hint: this is a company secret which roots the hair to the scalp) can be combed, brushed, styled and even washed. 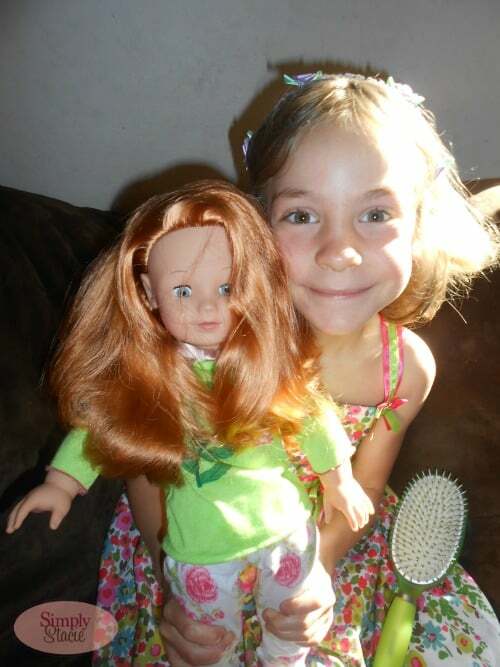 It doesn’t get all of those dreaded knots and tangles so it is much easy to keep the doll’s hair brushed nicely. For collectors and older children the doll’s hair can even be blown dry on low heat and curled if desired which is a wonderful, unique feature. The Precious Day doll collection is wonderful for girls who love to style their dolls hair and you can watch this video to see the Götz hair styling techniques including braiding, double knot and even cornrows! There are many different styles of Götz dolls to choose from at HABA including the Aquinis line which can be played with in the bath and Muffin dolls which are the sweetest little baby dolls! Götz is an award-winning doll line and it is easy for me to understand why this company has been an industry leader for over half a century…..the dolls are exquisite! You are invited to visit HABA USA to browse the entire collection of Götz dolls and accessories! i like the Maxy Muffin – 16.5 inch Doll, No Hair and White Outfit – Gotz (2013). That hat is way too cute. My pick would be the Maxy Aquini – 16.5 inch Doll, 7 Piece Set, Blonde – Gotz (2013) . I would choose the Maxy Aquini – 16.5 inch Doll, 7 Piece Set, Brunette as my favorite. I like the Maxy Muffin doll but they are all good. I like the Cosy Aquini-13 inch blonde with overalls. I’d pick the Maxy Muffin – 16.5 inch Doll, Blonde – Gotz (2013). I would choose the Maxy Muffin – 16.5 inch Doll, Brunette with Floral Outfit.